Although Get Rich Slowly doesn't sound quite as exciting, it works and it's safer! One of the biggest temptations as an expat is to enjoy your new life a little bit too much and forget to save. But saving even a small amount each month into an investment plan can make a huge difference to your future, whether the savings are for school fees, a new home or retirement. In this blog we'll show you how much you need to save to become an expat millionaire. The sooner you start, the more regularly you save, the quicker you'll achieve millionaire status. 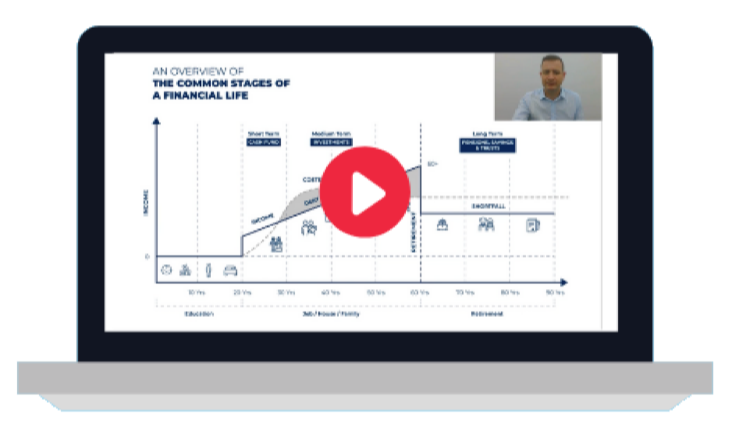 You'll also be shown how to open an international investment account that gives you the flexibility to start, stop or invest lump sums without the usual high charges and high commissions that most offshore savings plan hit you with. As you already know, there are many benefits to moving overseas and starting a new life as an expat. Housing and travel allowances, and in some cases a tax-free income, are just some of the perks on offer. It was the legendary investor, John Templeton, who said "the best time to invest is when you have money". Time is one of the greatest opportunities an investor has because of the power of compounding investment returns. With a monthly savings plan in place, you can have the money automatically taken out of your offshore bank account once a month, and invested into a huge range of funds, shares or bonds. The chances are that after a few months you won’t even notice the money coming out of your account. So, let’s take a look at how much you can save and what it might be worth in the future. [Assume 6% growth after tax and charges. These figures are for illustration only and not guaranteed. Your Investments can fall in value as well as rise so you could get back less than you invested. The amount you actually receive will depend on the performance of the investments you choose. Also inflation will reduce the spending power of your capital over the long term]. So to be an expat millionaire (see assumptions and small print!) the amount that you need to save is £1,500 per month for 25 years, which is perhaps not as much as you would have thought! 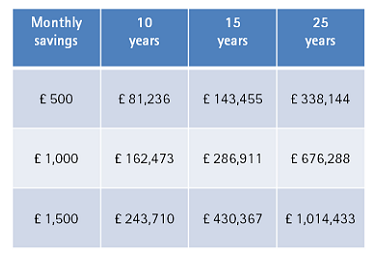 In one of our earlier blogs, we looked at how much money is needed to meet your goals if you live in the UK, on average. But even if you invest a small amount each month, the earlier you can start saving on a monthly basis, the more time your investments have to grow through the effect of compounding investment growth. 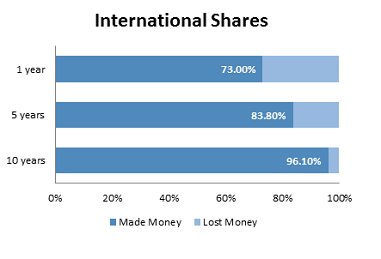 Making regular savings into an offshore investment account over time also means you can benefit from pound cost averaging, which put simply means each time you make an investment, sometimes you will buy more of the funds you are investing into if the fund is falling in value, and sometimes less of the fund, if its value is rising. This disciplined approach to investing means you buy into your fund at a lower average cost over time. It’s also worth pointing out that the longer you stay invested the better, because the markets reward long-term investors omre consistently. So if you have £500 a month or more to save, and you're ready to get started on your path to becoming an expat millionaire what should you do next? Sign up for an AES International Investment Account or the brand new Index Account and get started. And as a takeaway, don't forget to download our guide below, How to become an expat millionaire, and begin your journey to earning your magic number! Final word - if you're not sure which path to take, talk to us - we're here to help you! Editor's Note: This post was originally published in January 2015 and has been updated January 2017.